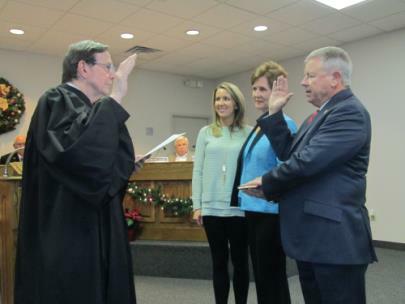 Two Soddy Daisy commissioners were re-elected in November when their current terms were ending, Rick Nunley and Robert Cothran. 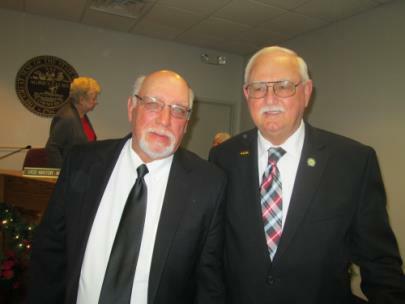 At the Thursday night commission meeting, both were sworn in by Judge Clarence Shattuck. With the beginning of a new term, the new council elected the mayor who will serve in that position for two years. 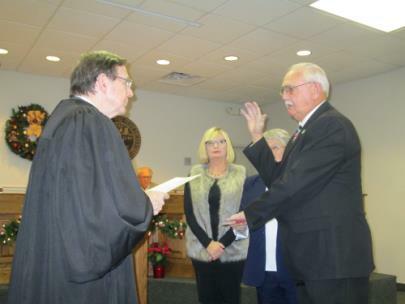 Gene Shipley, who has been a commissioner in Soddy Daisy for 23 years, was unanimously elected as mayor. He will be repeating the role he has had twice before. Robert Cothran, who just completed serving two years as mayor, was elected to the position of vice mayor. After being on the commission for the many years that he has, Mayor Shipley said that this is one of the best groups he has worked with. He said that the members do not always agree, but that they do not get mad about it. He also thanked Robert Cothran for doing such an excellent job during the past two years as mayor. Two members of the city’s planning commission are appointed by the commissioners. Mayor Shipley chose Robert Cothran as the mayor’s selection and Rick Nunley as the commission’s appointment. Both have currently been serving on the planning commission. The commissioners voted to adopt the Hamilton County Disaster Debris Management Plan. All the cities in Hamilton County will participate in the plan. Each municipality will create an inventory of equipment that is available to use during emergency situations. Not every city is expected to need the same equipment at the same time. This plan will identify resources that will be available to share in the event of a disaster. Bids were open last week, said City Manager Janice Cagle, for lighting for girls’ softball fields at KIDS Park, on the north end of the city. The lowest and best bid was $179,000, which was approved by the commissioners. The cost may increase if it is discovered that more concrete will be needed than originally was estimated. This was a budgeted item, said Ms. Cagle. Steve Grant, director of the public works department was also authorized to purchase salt in order to be prepared for icy road conditions during the winter, for the amount of $7,000. This too, was included in the 2018 budget. Commissioner Jim Adams began a discussion about donations to the Humane Society. The city manager said that the city pays the HES $78,000 each year for coming to Soddy Daisy one day a week. The commissioners agreed with her that amount is ample for the help that is provided to the city. The mayor apologized to citizens who were expecting paving to be done this year. Due to the flooding that the city experienced, that roadwork had to be put off, he said. Paving will begin in spring 2019, he said. Steve Grant said that he has received a citizen’s complaint about traffic backing up during the morning rush hour at Gann Road and Thrasher Pike. The city manager, who lives nearby, said that she has never had more than a three minute wait at the intersection. The police and a public works department will station representatives from each department to observe and document traffic at the intersection to help determine if an extra lane is needed. City Attorney Sam Elliott noted that this would be the last commission meeting for 2018. The regularly scheduled meeting on Dec. 20 has been cancelled, as well as the first meeting in January. The next meeting of the Soddy Daisy commission will be January 17, at 7 p.m.